Worrying is very normal and yet harmful. Help your players gain control by replacing their worry. Discover how to flip the script on your worrying and put yourself back in charge! Let’s talk about worrying for a minute. Worrying about something is a powerless place to be. Worry is inactivity, anxiety, concern, fretfulness and if it goes on for long can become something pretty serious. But, we all do it. We worry when there are problems in our lives. The thing we worry about only creates more worry. It’s like a mutant virus that just keeps making more of itself. When we worry we put the thing we’re worrying about in control. When we worry, we become a victim. Definitely not a great place to be! It’s a hitter who just struck out being worried that her coach will bench her. There’s no solution in sight, only emotion and anxiety. Instead, flip the script. Grab hold of the levers and get in charge by coming up with a plan. In the case of our hitter worrying about getting benched, come up with a plan to hit the pitcher. She can develop her plan by watching the pitcher to see if her pitches have any patterns, reviewing her previous at-bat with her plan in mind, talking to her coaches and teammates to gather intel to add to her plan. 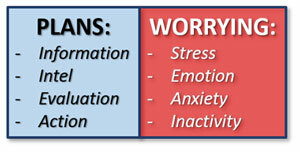 Taking action definitely beats worrying, and yet if you listen to your players talk, notice how often they mention the word “worry”. Words matter. When anyone is worrying they are not in control, and softball players need to feel in control if they’re going to be successful. Help your players transform their worrying into a plan and help them get back in control! For more help with all aspects of your coaching – become a Vault Classic member today! It’s the greatest collection of softball coaching information on the internet!